This is by far one of the best methods ever conceived for the classic cards across trick. It is also one of U. F. Grant's best card effects for stage. The method is completely different from Zen's Fifteen Card trick in that no duplicate cards are used. One regular deck is used and only two unprepared personal size envelopes. There are no stacks of any kind. Finally, there is no palming of cards as in other methods. The method is very easy to do and a feature for stage that is a real fooler. Just one regular deck and two envelopes, along with a pencil to sign the cards will give you a real show stopper. EFFECT: The performer invites two people to come forward. He hands them a deck of cards to shuffle. The person on his left deals 15 cards into the performer's hand. The performer takes those same cards into the audience and has three people remove a card (no force) and sign their name on it. These three signed cards are returned to the packet of 15 cards and the cards are mixed. The performer gives those cards back to the person that was on his left to seal in an envelope he has examined. The spectator then marks the envelope and keeps it in his possession. The spectator on the performer's right is then given the deck and asked to deal off 15 cards. These cards are then sealed in the second envelope. The second spectator marks his envelope too, which he retains. There is positively NO switch of the envelopes. Only two envelopes are used. 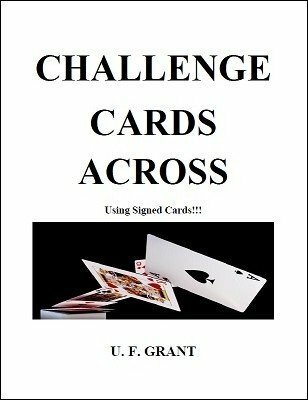 The performer commands the three signed cards in the first envelope to pass to the second envelope invisibly in a comical manner explained in the directions. The spectator on the left opens his envelope and counts the cards. He does it, not the performer. There are only 12 cards and the three cards that are missing are the signed cards! Without the performer touching the second envelope, the spectator on the right is told to open the envelope and count the cards. He finds there are now 18 cards in his packet. The spectator looks through his packet and finds three signed cards which he removes and hands to the performer. The performer takes these three cards back into the audience and has the three spectator's confirm these are indeed the cards they just signed. Baffling beyond words and a real U. F. Grant gem. 1st digital edition 2017, 5 pages.